I eat a banana almost every day. My husband is allergic and my son claims he doesn’t care for the taste, but during the week if I do not have my banana I feel like some do when they miss their cup of coffee. I started my sewing journey to try to get out of the kitchen and away from the baked goods. 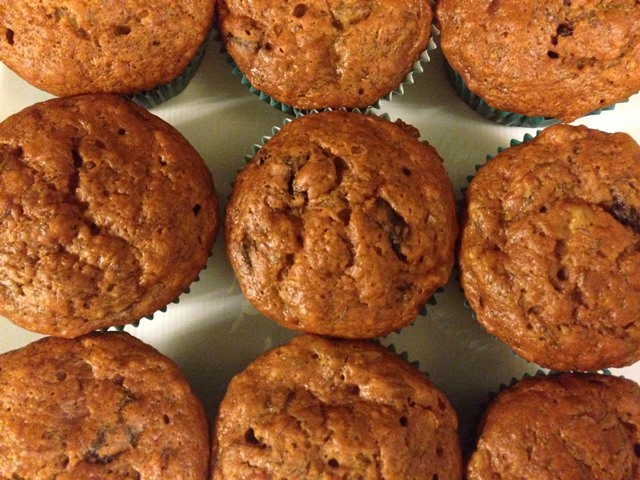 However, there were 3 very ripe bananas just calling to me “we want to be banana muffins, we want to be banana muffins.” What is woman to do but put down the sewing needle and make some muffins! I have tried many different recipes for banana muffins, but this time I wanted to swap out refined sugar and use honey so I created this one myself. I also added chocolate because everything is better with chocolate. I think you can add nuts as well. I hope you like it. They turned out great and even my son ended up eating two muffins ;). You can make this with soy milk if milk isn’t your thing. In a large bowl mash bananas and mix in honey. Add dry ingredients to banana mixture and mix well. Gently add in chocolate chunks. Line 12 muffin tins with liners or a greased and floured muffin tins. Bake in a preheated oven at 350 degrees for 30 mins or until toothpick in center comes out clean.